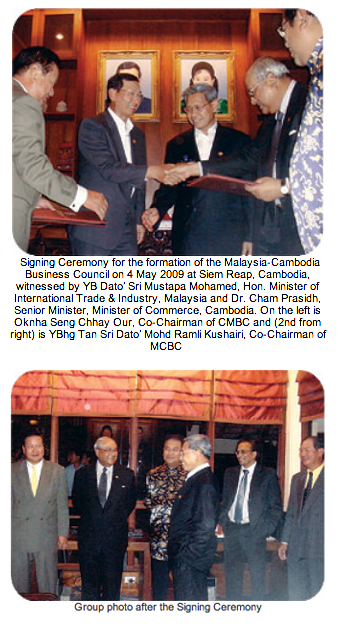 The Malaysia-Cambodia Business Council (hereinafter referred to as the Council) was formally established on 22 November 2010 with the principal aim of promoting and fostering closer relations between Malaysia and Cambodia, particularly in establishing mutual understanding, goodwill, harmony and fraternity amongst the business communities of both countries. The Council’s objective is, amongst others, to encourage co-operation and collaboration between the private sectors of both countries. To this end, there is also a separate chapter in Cambodia which is called the Cambodia-Malaysia Business Council. Together, the two Business Councils aim to facilitate, systematise, and enhance the bilateral business relationship between Malaysia and Cambodia. The Council has an initial membership of 14 members representing corporations with diverse business interests in Cambodia. Prior to the establishment of the Council, its pro-tem members at that time had led a business delegation to Cambodia in 2010 to discuss, amongst other investment and trade opportunities, the low frequency of flights between Malaysia and Cambodia as well as Malaysia’s drop in ranking as an investor. The Council aspires to expand its membership to companies interested in undertaking business activities in Cambodia. In this regard, the Council has an open policy with respect to prospective members and it offers three types of membership, namely ordinary membership (for corporations), associate membership (for lawfully established organisations, ex. partnerships) and honorary membership (for individuals, by invitation from the Council). Azmi & Associates have been appointed the Honorary Secretary to the Council and can be contacted at: Level 14, Menara Keck Seng, 203 Jalan Bukit Bintang, 55100 Kuala Lumpur.